A toe injury refers to any damage to the structures of the toe. Toe injuries are very common as most people are prone to foot injuries. 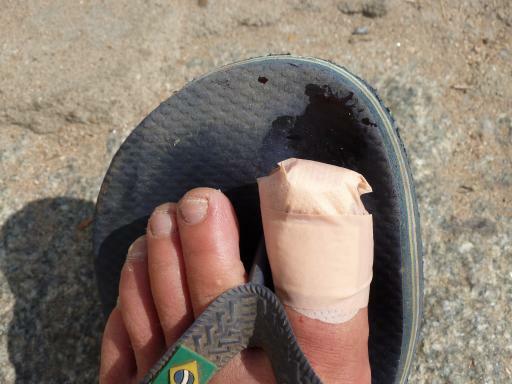 Soft tissue injuries to the toe include lacerations, puncture wounds, abrasions and toenail injuries. A person with a toe injury may experience toe pain, toe swelling, toe redness or bruising of the toe. Additional symptoms include cuts or lacerations, puncture wounds, toenail injury and deformity of the toe. Treatment for toenail injuries generally involves resting the toe, cold compresses and elevation. Additional treatment options may also include protective footwear, toe splint, crutches, non-steroidal anti-inflammatory medication or acetaminophen for pain. Minor cuts and skin bruises may require wound cleansing and topical ointments. Severe fractures of the big toe may require surgery. Disclaimer: this page on toe injury and its causes, signs, symptoms and treatment is for learning purposes only. To learn how to recognize and manage toe injuries and other minor and major injuries sign up for first aid and CPR classes with St Mark James. Most toe injuries are caused when a toe hits a hard object or surface or when a heavy object is dropped on an unprotected toe. To learn more about toe injuries, symptoms, signs and treatment enrol in St Mark James first aid and CPR classes with one of our training providers.